The most interesting aspect of stage two for me was big Tom Dumoulin finishing second. It would be good to see a time triallist competing for Grand Tours again. It would bring a new dimension to the racing. I doubt it’ll happen this year, but consider this some sort of foreshadowing of things to come. Dumoulin didn’t get the headlines, though. Nor did the ferociously smiley Colombian stage winner, Esteban Chaves. 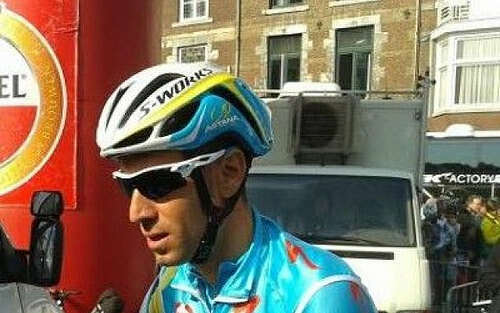 The big news was Vincenzo Nibali getting himself slat off the race for taking a tow from his team car. When is a cyclist not a cyclist? It’s rather a shame that Nibbles is out because there was a high likelihood of dummy-spitting while he was around. Firstly, he doesn’t massively get on with team-mate Fabio Aru and I was interested to see how that panned out. Secondly, he seems to be sinking into some sort of petty feud with Chris Froome. For entertainment purposes, the very best kind of feud is a petty one. At the Tour, Nibali thought Froome had knocked him off his bike and threw a bidon at him. Froome later boarded the Astana bus to thrash things out. Later in the race, Nibali attacked Froome when the Kenyan-Briton had a mechanical. Nibali claimed he didn’t know, but TV coverage showed him turning his head through 180 degrees to stare straight at Froome, turning again for a confirmation look and then attacking while indulging in a third look. It rather looked like that semi-infamous moment had come back to haunt Nibbles on stage two of the Vuelta. After he had been caught up in a crash and was stropping around waiting for a replacement bike, Team Sky surged to the front to press on and make life difficult for him. With quite a lot of riders held up, it wasn’t very cool of them, but assuming they were trying to punish Nibali, it was quite funny. The Sicilian managed to get back to the peloton eventually, but was shagged out by the time he got there and lost a minute or so on the final climb. A little while later, he lost even more than that when the race judges ruled that his blatant cheating was blatant cheating. ‘I think maybe they’re picking on me because of who I am,’ was the gist of his defence. No, Vince. They’re picking on you because you were at the front of a large group of riders when you suddenly transformed into a sidecar and departed over the horizon. I wanted to make a joke about it being a “Superb” ride by Nibabli, but Astana use VWs; so maybe something about him dancing a Passat-doble? Who’s to say he wasn’t pushing the car anyway.